@AryToNeX, read the top of the forum. Great app! Thanks. Only bug is the play/pause button freezing. Its working but the icon itself is fixed to "'pause" icon. I hope it'll be fixed soon, then I' ll buy you a beer? @AryToNeX, I have no idea for update. I tried to colorize but seems it working only with media session that I cann't get. @Ryukyus, can you provide a video? Working flawlessly on custom ROMs, even the substratum themes are applied on it. I hope this is thread is made sticky so that everyone can benefit from this cool app. @TheTallGuy, I'm hoping that soon we get a beta and this thread will be deprecated. Whether this notification issue (Oreo 8+ version Notification issue) will be fixed in next update. If yes, then when we will receive the update message. Wtf man that apk both 1.20 & 1.30 version won't work on phone... They won't open.... How am i suppose to fix my notification panel issue.. 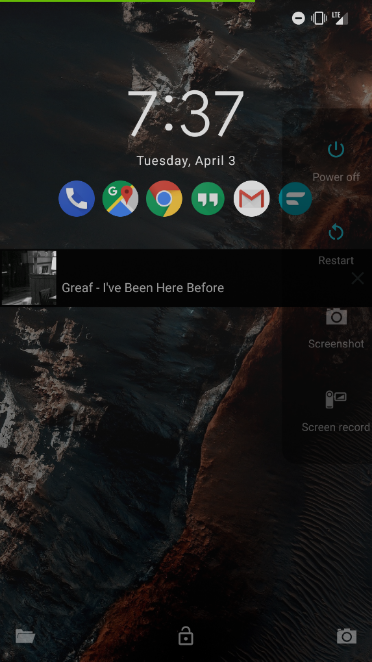 I cannot change / stop songs from Notification panel.. Please fix in next update... Using oreo 8.1.. 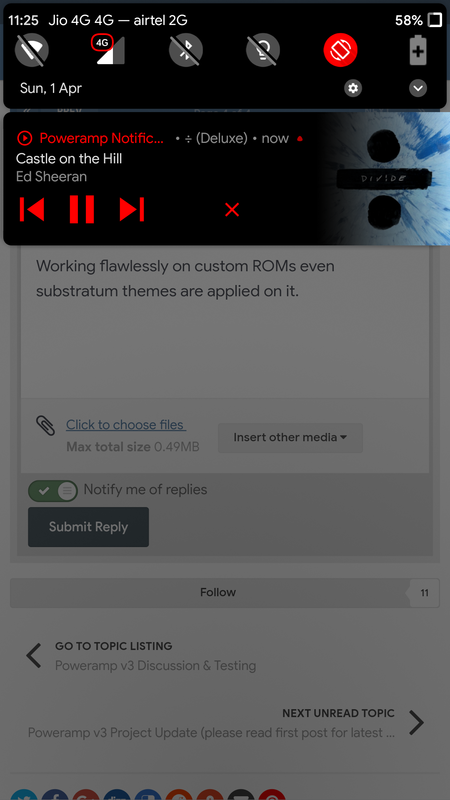 Fix that notification helper / Poweramp itself. @clever_man very generously wrote this app to help other Oreo 8.1 users out until the main Poweramp app gets its next beta release (hopefully this month). So less of the attitude please. I don't know what I must fixed because you (and other two men with the same problem) didn't provide some usefull information. @TheTallGuy What substratum theme are you using? That looks awesome. @protocol717, read my latest post and respect other users. Your post is useless. @OVOgrey, it will be in the beta release. Download Notification Helper v 1.3, download ES File Explorer (or any other file explorer), go into the file explorer, find Notification Helper in downloads, select it, then select "install apk". I installed this app and followed instructions from the original post. Worked well for a couple days, now I have two notifications in my notification area. No matter what setting I chose they won't go away unless u uninstall it. I'm using oreo 8.1, anyone? @Repo97, if you uninstalled the app, it can't post notification. No sorry it did not work after a couple days so I uninstalled it. I will try reinstalling again and post results. I I am on Oreo 8.1 pixel 2 and also experience the black text on black background bug and cannot use any of the notification controls. I am rooted and have Xposed installed so as a work around I just use the gravity box feature of skipping tracks via long pressing the volume keys. I prefer using this anyways as I don't have to turn my screen on. 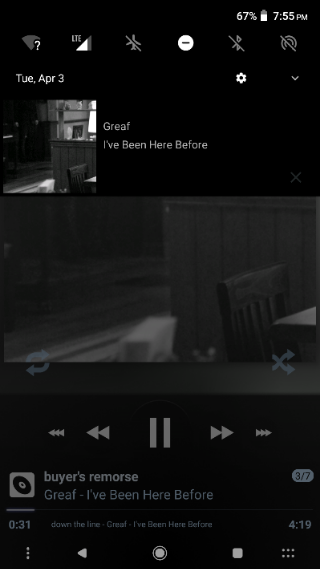 This is probably the best media player around and have a hard time using other ones so hope there is fix soon. I did get an email from Poweramp support and they will be fixing this bug eventually in a new update. Not sure when. I tried using the app and still have an issue with black text on black background but I'm suspecting it's due to my theme as the x button on the lockscreen notification now works. I would have to remove overlays and check. Seems like a good fix though and really was not a carnival act to apply, pretty straightforward. Thanks. Just tested it again the play button worked too when I pressed around for it and got the non visible skip to work as well. But I did notice the track listing doesn't change to the new one. Still great quick fix by someone not the developer so thanks. Will just wait for the fix, this app is worth it others don't compare. It should be fixed in the next beta-test release, which the dev has recently said will come out this month.